Our special ground shipping rate within California is $25 for 1-6 bottles and $30 per case! Our signature 2013 Cabernet Sauvignon has spent two years aging in French, Hungarian and American oak barrels. 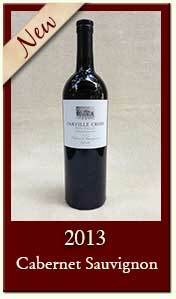 Harvested in mid-October, this Cabernet Sauvignon is ripe with vibrant plum and cherry with a hint of vanilla and anise. Long soft finish -- ready to drink now, will age gracefully 10+ years. Production was limited to 150 cases. If you would like to mail in your order, please print our PDF order form here. Friends and Family Wine Club Members receive a 20% discount on all wine purchases (excluding pre-discounted items) -- join our Friends and Family Wine Club now.